The Chatham Anglers (15-13-2) are currently on one of their best stretches of the season. Even though they lost a fog-shortened game Sunday to the division-leading Yarmouth-Dennis Red Sox. 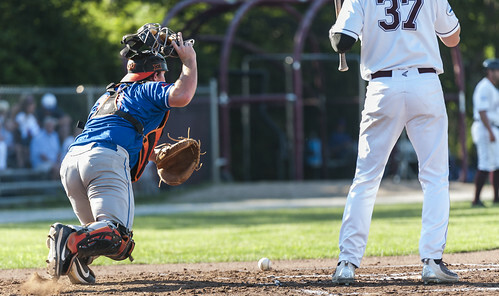 Over the past seven games — of which the A’s have won five — Chatham has been solid in all aspects of the game, whether it be at the plate, on the mound or on the bases. With three divisional matchups this week, the Anglers have a chance to push themselves closer to a playoff spot. Spencer Torkelson (Arizona State) returns from Team USA this week. What will his reintroduction mean to the Chatham lineup? 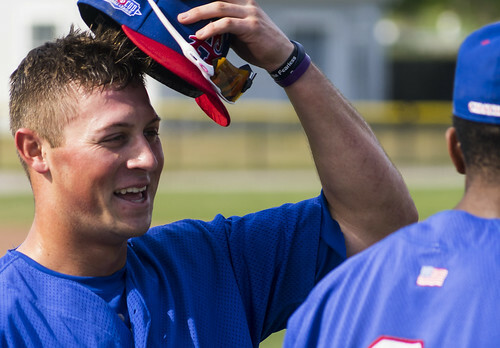 David Schneidman: Although three Chatham players — Tristin English (Georgia Tech), Michael Busch (North Carolina) and Blake Sabol (Southern California) — successfully filled the slugger role that Spencer Torkelson (Arizona State) once filled for the Anglers, the A’s will be ecstatic that their star is back. Torkelson’s return comes at an ideal time for Chatham, as several of its hitters — Sabol, Colin Simpson (Oklahoma State), Drew Mendoza (Florida State) and more — are in their best form of the season. Yes, it means someone will have to sacrifice their place in the starting lineup, but if there is one problem A’s manager Tom Holliday wants to have, it’s an abundance of in-form hitters. Torkelson’s contributions from June 12 to 24 were unparalleled. The California native smacked five home runs and 14 RBI in 12 games for the Anglers, both league-highs at the time of his departure. Despite having half the sample size of most A’s players, Torkelson leads the team in batting average (.389) and on-base percentage (.520). Peter Warren: Torkelson’s impact on Chatham goes beyond his ability as an adroit batsman as his return leaves a lot of questions with the defense. Torkelson started all 12 of his games for Chatham in right field. He looked comfortable at the spot, despite playing mostly first base and left field at Arizona State. In his absence, a variety of players — including English, Adam Fogel (Hawaii) and Sabol — have started in right field. Torkelson could see time at all three spots depending on what Holliday wants to do. The returner is not the only player who can play multiple spots. Sabol has played four positions this summer — catcher, first base, left field and right field — and has even taken I/O at third base. English has played left, right and first in addition to pitching. Simpson has played most of the time in left, but has started catching and has played a game at second base. Michael Busch (North Carolina) can play both positions on the right side of the infield and Jorge Arenas (Stetson) is a plus defender at three infield spots. Suffice to say, Holliday has plenty of options when it comes to positioning. The Anglers made several transactions over the past few days. What were they and how will they impact the team? DS: Hunter Gaddis (Georgia State) and Nick Kahle (Washington) were released by the Anglers this past week. Gaddis was one of Chatham’s top pitchers during his time on the Cape. The right-hander has logged the sixth-most innings (18) on the team and was one of four pitchers with a 2.00 ERA or less with at least 10 frames of work. All five of Gaddis’ runs allowed came in the same outing — at Wareham on June 27. In each of his four other appearances, he allowed zero runs and two hits or less. Kahle’s summer was not as successful as Gaddis’. The California native caught all 61 games for the Huskies during the college season but did not see consistent playing time under Holliday. Kahle battled for playing time with four other catchers — Sabol, Kyle McCann (Georgia Tech), Simpson and Jake Taylor (Oklahoma State) — and recorded just 16 at-bats in 11 games. The loss of Kahle will not be a big inconvenience for the Anglers. There is no denying that the Washington product is a fantastic player, but his lack of success at the plate along with stacked competition at the catcher position made it tough for him to consistently see the playing field in Chatham. Gaddis’ departure, on the other hand, will leave a major hole in the rotation. The A’s can never have enough solid arms, and the departure of Gaddis means the Anglers lose one of them. PW: The Anglers picked up two pitchers in the last two days — Zack Noll (Point Loma Nazarene) and Brock Riley (Salem State). Holliday said that he hopes at least one of them becomes a solid arm out of the bullpen. Noll spent the last two years at Oregon. In his freshman year, he made four starts and struck out 24 batters in 17.2 innings. He came out of the bullpen his sophomore year, making eight appearances and again averaging over a strikeout per frame. Getting another left-handed arm was something that Holliday has been talking about for the past few weeks. As for Riley, the rising senior threw over 51 innings at Salem State, finishing with a 7-2 record with four saves and a 3.66 ERA. Holliday said he does not know a lot about him, but thinks he could provide something unique in the bullpen. After dropping four of five games last week, Chatham has won five of its last seven. What changed? DS: Sabol was a solid contributor prior to the Anglers’ recent stretch of wins, but as of late, he’s been one of the best bats in the league. In his past seven games, Sabol has nine hits and eight runs scored. The left-handed hitter boosted his batting average from .289 to .333 and now ranks first on the team in home runs and RBI. Sabol’s power has been the a prominent reason for Chatham’s recent winning ways. The USC product has hit a long ball in the second inning of three-straight games, sending him to seven on the season, the highest mark in the league. In games against Orleans and Harwich on July 13 and 14, Sabol blasted a solo-home run as the first run of the game. When Chatham scores first, it is 12-2-1. PW: A few weeks ago, Simpson said that he hits better when he plays catcher. At the time, it seemed more like an interesting theory. After watching Simpson over the past week, I think he may be correct. Simpson made his first appearance behind the dish in the second game of Tuesday’s twin bill against Falmouth. Since that game, he has been raking at the dish. The rising senior is 11-for-17 with a home run, triple, three doubles, seven runs scored and four walks during that stretch. In addition, he has raised his batting average by 100 points since July 9. Simpson is not the only Chatham hitter to be finding his stride at the halfway point. Drew Mendoza (Florida State) is hitting .333 over the past week and is currently riding a six-game hit streak.